Die bisher wenig bekannte Gruppe aus Andorf in Österreich veröffentlichte neben ihrer LP "Stoned wall", die heute unter Sammlern mit etwa 1500 Mark im Bestzustand gehandelt wird, von 1970 bis 1972 noch vier Singles, von denen die letzten beiden auf der LP enthalten sind und die ersten beiden der CD als Zusatz angehängt wurden. Damit ist das gesamte veröffentlichte Werk der Art Boys Collection auf ihrem Silberling zusammengefaßt. Den musikalischen Übergang, der in England und den USA schon in den späten Sechzigern vollzogen wurde, holten die fünf also mit ein paar Jahren Verspätung nach. 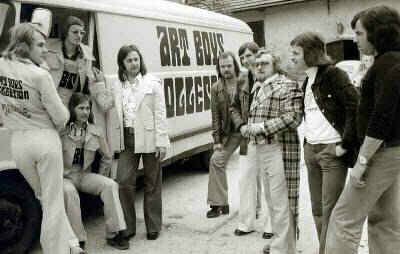 Art Boys Collection are not a progressive rock band. There is a moment or two of progressive rock-ness, however, and this is mainly in the organ of Walter Holz. However, that progness is limited to a couple of tracks, and even then it's hard to make a strong case for this as fact. I will say that a vague reference to King Crimson's "In The Court Of The Crimson King" can be made with "Stoned Wall," a very faint hint of Keith Emerson in "Flying Machine," and maybe some of the psychedelic touches of the bonus tracks would qualify as a proto-prog prog. But for the most part, what you have here a fairly standard and imitative early 70s 50s- and 60s- influenced pop rock. 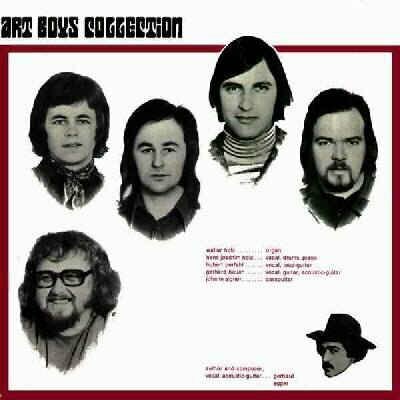 Admittedly, the Art Boys Collection didn't bill themselves as a progressive rock band, as they were a beat band, a style that has been mentioned more than once in connection with the early days of very famous British quartet. That is to say, The Beatles. The influence here draws not only on the band as a band, but the members of the band after the split in 1971. "Roll Engine Roll" is, but for the chorus, much like Ringo Starr's "It Don't Come Easy," (which, interestingly enough, came out 1973; Stoned Wall was released in 1972). "Wait For The Days" hints at bit a George Harrison's "My Sweet Lord" in the rhythm of the acoustic guitar, though otherwise this song is very psychedelic. Here as on the "Roll Engine Roll," vocalist Hans Joachim Holz also sounds like Starr. The upbeat rocker "Happy Woman" has the distorted guitar sound that Harrison adopted for 1965's Rubber Soul -- there are many references but "Drive My Car" is what jumped to mind. "Station Nowhere" is a mellow, dreamy, psychedelic, McCartney-esque piece. Divergent from this ex-Beatles fest is "All My Life," a chirpy 60s pop ditty as catchy as any of the more widely known artists of the period. The Kinks come to mind with "I'm Riding On An Arrow," a darker toned guitar based piece, with a psychedelically echoey chorus. "In A Foreign Country" is straight out of the 50s-era (I thought of "Silhouettes" by The Crests), and the Mama's And Papa's like "Jesus Said." The bonus track "Lemon Tree" takes this and the Byrd's and the folky based rock of the 60s wrapped into one. In fact, early Bee Gees come to mind, too. Chuck Berry should come to mind with "United Blues Generation" via the Beatles, and we know that Beatles admired the 50s rock of Berry. Actually, this piece sounds like the Mama's and Papas performing a signature Berry tune as if they were the Beatles. An interesting curiosity, well preserved by GoD as this was taken from a well-kept vinyl version and declicked using the Ceder NoNoise system - which I'm not contractually obligated to mention (and there's no contract anyway), but should since the sound quality is very good, and the source sounds true for the times. But, it's a fairly average, well played bit of nostaligic rock - they reference well. Life is a dream / United blues generation 7"
Lemon tree / A walk in the rain 7"
Jesus said / Station nowhere 7"
Freedom / Voice of my soul 7"